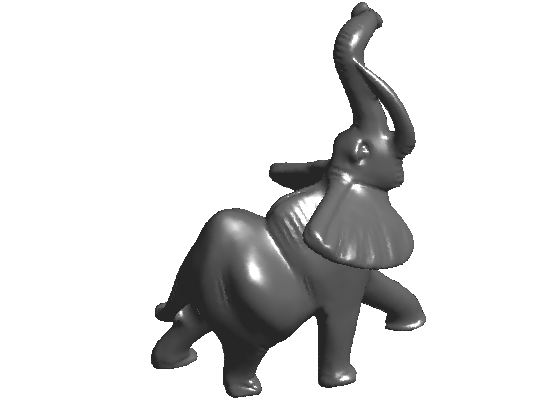 This tour explores some basics about 3D triangulated mesh (loading, display, manipulations). A 3D mesh is composed of a vertex array of size (3,n) that contains the position in 3D (or sometimes 2D) of the vertices, and a face array of dimension (3,m) that contains the indexes of each triangulated face. One can load the mesh from a file. The face matrix store the topology (connectivity) of the mesh, while vertex stores the geometry (position of the points). In the following, we consider modification of the geometry only. One can display the mesh as a piecewise linear surface. You can zoom on the mesh and display its triangulated faces. 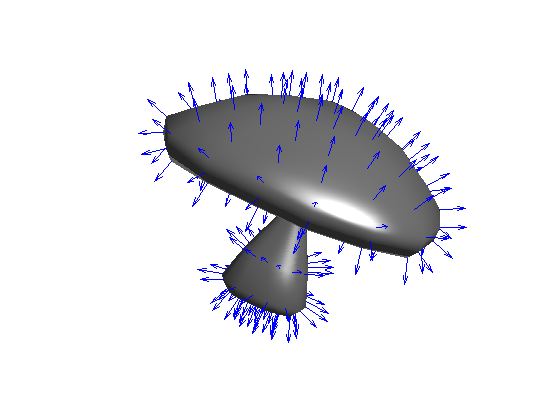 A function assign a value to each vertex of the mesh. The vertex position stored in the matrix vertex are actually 3 functions X/Y/Z. The vertex data can be modified, while keeping the connectivity face fixed. 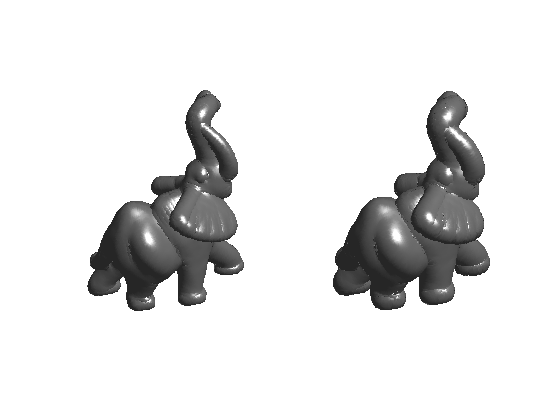 Random perturbation can be added to the positions (here only on the right side of the mesh). The mesh can be warped. 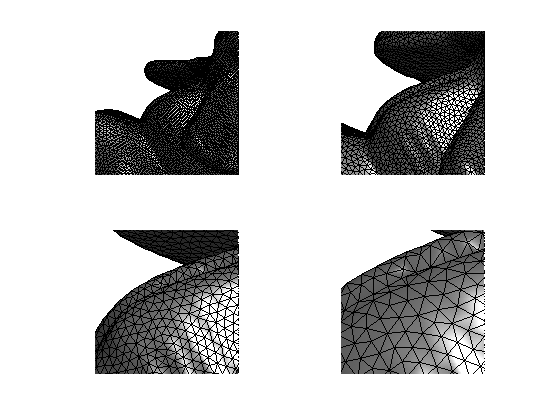 The norma of the mesh are easily computed on each face (by computing the normal to the triangle), and can then be interpolated to the edge and vertices by averaging the surrounding faces. 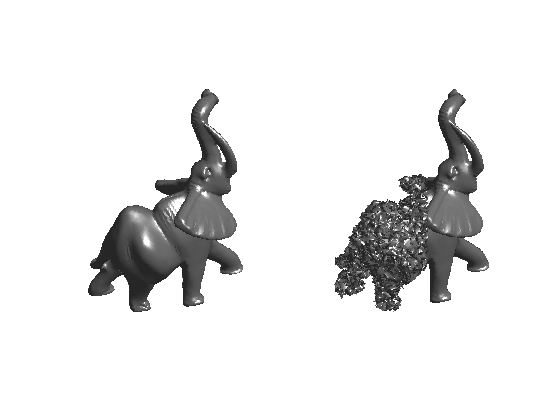 Load a small mesh for the display of the normals. Display the mesh and the normals. You can extrude the mesh along the normal direction. 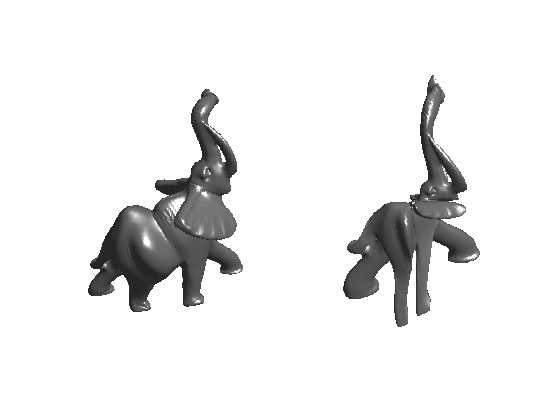 You can compute matrix (sparse) of differential and averaging operators on 3D meshes. There are several ways to define these operators, first depending on the precise definition of the weight used for the computation. 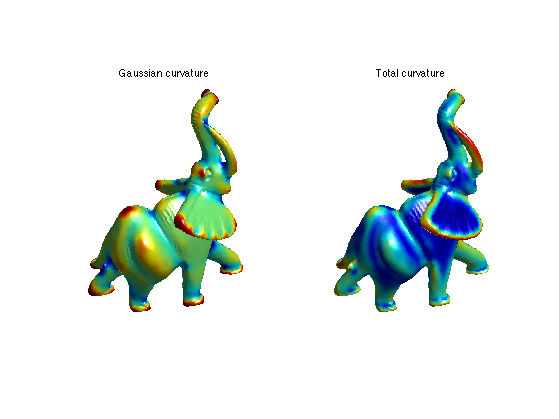 Here we use 'distance' weighs, but you can try with 'conformal' (that are more precise since they depend on angle, but they are also slower to compute) and 'combinatorial' (that are less accurated since they depend only on the topology of face, but are fast to compute). A weight matrix is a weighted adjacency matrix that acts as a low pass filter. A laplacian is an high pass operator that compute second order derivatives. 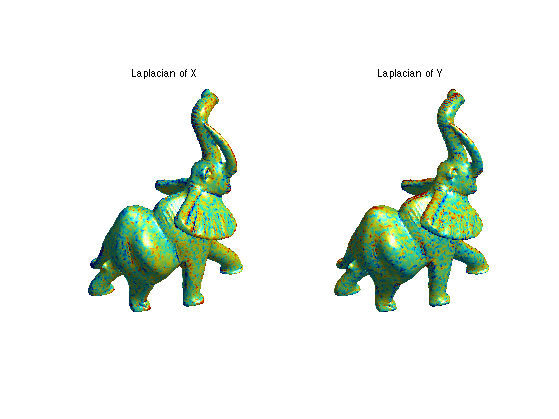 Here we use a 'distance'-based Laplacian, that is fast to compute and quite accurate. We can compute the Laplacian of a function on the mesh, for instance the X and Y position. Clip the values to enhance the color display. Second order derivatives gives access to curvatures direction and informations. Since higher order derivative are quite sensitive to noise, one needs to computes them using local averaging. You can compute curvature quantities using local avergaging and PCA analysis.